"Sometimes, it's better to choose your own family." Magnolia Pictures has released the official US trailer for the Palme d'Or winning film Shoplifters, the latest film from beloved Japanese filmmaker Hirokazu Kore-eda (Nobody Knows, Like Father Like Son, Our Little Sister, After the Storm). 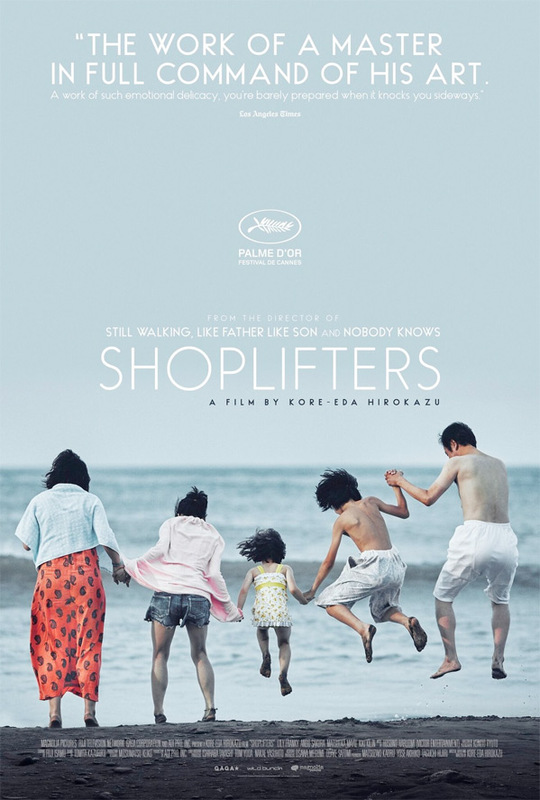 Shoplifters is about a family of small-time crooks, but the story is really about what happens when they take in a young girl they find living on the street one day. The film's cast includes Lily Franky, Sakura Ando, Kirin Kiki , Kengo Kora, Sosuke Ikematsu, Chizuru Ikewaki, Yuki Yamada, Yoko Moriguchi, and Akira Emoto. This mostly understated, beautiful Japanese drama won big at Cannes, but also won the hearts of cinephiles, earning effusive reviews from some of the toughest critics out there. If you're looking to discover some of the finest filmmaking this year, this should for sure be at the top of your list. It's a must watch film from Japan. You can still watch the original international trailer for Kore-eda's Shoplifters here, for more footage. After one of their shoplifting sessions, Osamu and his son come across a little girl in the freezing cold. At first reluctant to shelter the girl, Osamu’s wife agrees to take care of her after learning of the hardships she faces. Although the family is poor, barely making enough money to survive through petty crime, they seem to live happily together until an unforeseen incident reveals hidden secrets, testing the bonds that unite them… Shoplifters is both written and directed by acclaimed Japanese filmmaker Hirokazu Kore-eda, of films including Maborosi, Without Memory, After Life, Distance, Nobody Knows, Still Walking, Air Doll, Like Father Like Son, Our Little Sister, and After the Storm previously, plus most recently The Third Murder last year. This first premiered at the Cannes Film Festival this year, where it won the fest's top prize - Palme d'Or. Magnolia Pics will release Shoplifters in select US theaters starting November 23rd this fall.